Match individual section dimensions (width, depth, height) to that of the selected element. Provide an additional offset for those individual section dimensions (width, depth, height). 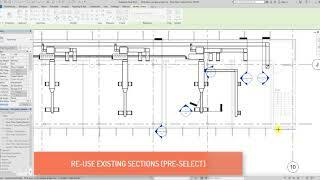 Allow alignment to elements in Revit links. Prevent alignment of sections associated with sheets. Enable prompt if a new section needs to be created when the option is disabled.